The Lost Girls » Blog Archive » Lost Girls Events: More Info on Shoot, Busk and Blog! 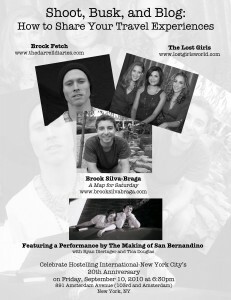 The Lost Girls > Lost Girls > Lost Girls Events and Tour > Lost Girls Events: More Info on Shoot, Busk and Blog! A few of you have written to ask: What exactly IS this Shoot, Busk and Blog event that’s happening a week from this Friday? We’ve included a few more details below, but in short, its an incredible opportunity to hear from and mingle with real travelers who have shared their adventures on a large scale—through song, writing, photos and film. The Lost Girls will join award winning documentary filmmaker Brook Silva-Braga, photographer Brock Fetch, the musicians of The Making of San Bernandino on a panel to discuss how we got the word out there about our travel-themed projects. Our hosts, Hostelling International, will be providing a fantastic free BBQ on their outdoor patio—the largest in NYC! To attend, register now on EventBrite as spots are filling up quick! For more information on this and other upcoming LG events, click here! Come to to meet other travelers and learn the best techniques to capture your travels. This panel discussion will be followed by a music peformance on HI-NYC’s patio (the largest outdoor patio in NYC!) by Tica Douglas and Ryan Dieringer performing as The Making of San Bernandino. This event is part of the Backyard International Festival Series celebrating HI-NYC’s 20th Anniversary! ‘The Making of San Bernardino’ is the winsome project of local songwriter and Portland, ME transplant, Tica Douglas, and bassist Ryan Dieringer of ‘The Powder Kegs.’ Douglas’ songs have been described as “exuberant and catchy urban folk.” At times wordy, always imbued with a wisdom beyond her years, Douglas shows what a former student of religion and literature who spent her childhood on the Maine coast listening to Brian Wilson and Bob Dylan can bring to the table, when she packs up her massive songbag and moves to the big city. Recently returned to the states after a year amassing a fanbase in Edinburgh, Scotland, Tica joins Ryan (of up-and-coming Philadelphia indie rock band, The Powder Kegs) for a string of dates in NYC.